The estate of Julia Feininger. H. Hess, Lyonel Feininger, London, 1961, no. 177 (illustrated p. 264). Rome, Marlborough Galleria d'Arte, Lyonel Feininger, November - December 1971, no. 3 (illustrated p. 13). 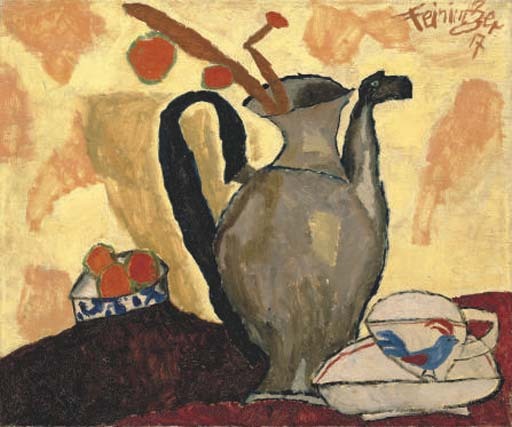 Tokyo, Marlborough Fine Art, Lyonel Feininger Retrospective: Oil Paintings and Works on Paper, March - June 1990, no. 2 (illustrated p. 13). Berlin, Neue Nationalgalerie, Lyonel Feininger, von Gelmeroda nach Manhattan, Retrospektive der Gemälde, July - October 1998, no. 38 (illustrated p. 96); this exhibition later travelled to Munich, Haus der Kunst, November 1998 - January 1999.